Ecommerce has gradually shifted from being a trend to being accepted as people’s normal shopping behaviors. It has taken quite a while to convince consumers to buy online and now even though most people are buying online, their options are also huge. The glut of eCommerce stores all looking almost like a clone of each other with similar offers and discounts means that there is hardly any loyalty in the online retail business. In such a scenario how do you make yourself stand out and make your customers loyal to you? By doing something very few people are – personalizing your products and the entire store as per customer’s’ tastes and preferences. It wouldn’t be wrong to say that personalized online retail is the future of eCommerce. The future belongs to those who make it super easy for customers to get the kind of products they want, the way they want them. 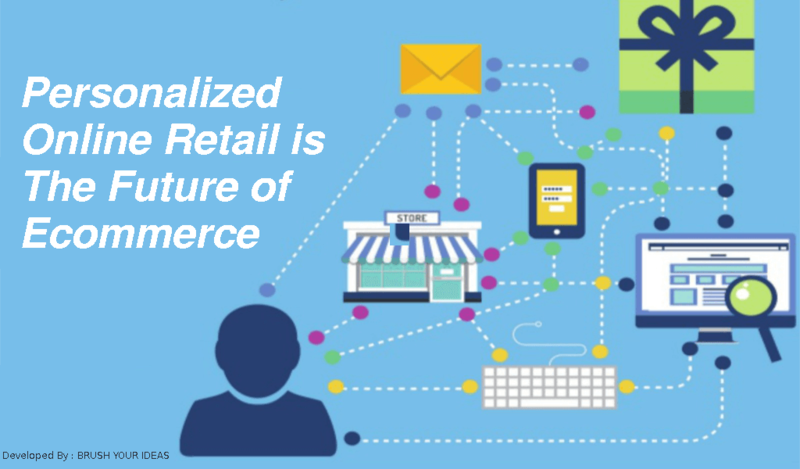 In this blog, we will explore this trend further and find out why personalized retail is the future of eCommerce. Personalization increases customer satisfaction so it can be said that it directly affects customers’ all over shopping experience. When a customer is surfing through a shopping site and can already see the products of his interest being reflected on the home page, it adds positive reinforcements to their experience. Furthermore, technology remembers more than humans can. What we mean is, your website can treat every customer like they know them already filtering choices for them and directing them to more interesting stuff. What we can’t ignore is the love for personalized products consumers have been showing lately. It’s surely not a fad but something that’s going to work for long. Getting personalized products is much easier at eCommerce stores than the traditional printers. Customers can choose the products of their choice and get them with their favorite graphics and design. The psychology of consumers to own something that represents them or their style is the reason behind the success of this concept. Hence keeping in view the increase in sales of these products, brands, and stores are rapidly moving towards launching products in this segment and you can easily imagine a future where every other eCommerce store is offering this like it’s just normal. And what does it take? Just an efficient product personalization Software to take on the designing work! With the advancement of technology, online retailers can now have a detailed report on what their customers are interested in, without them disclosing the information first hand. Sophisticated CRMs and data analysis can go way beyond to collect customer information and use that information to connect on a more personalized level. For example, eCommerce businesses can keep a check on what their customers are interested in and then use the information for personalized marketing. Rather than the ‘One shoe fits all’ campaigns, personalized campaigns work much more. Customers who see their name on an e-mail and know some worthy offer is up for them, are more inclined to open an email and see its contents than the others which they know are simply one of those hundred promotional emails. Remember the times when customers had some added benefits for buying repeatedly from the same shop? The personal interaction between the buyer and the seller has now declined to a drastic level with the popularity of the mall culture. But with the advent of this personalized culture online, people are getting those benefits again. eCommerce stores who take a note of their loyal customers and often treat them with offers and discounts see their customers come back more often. Therefore, for eCommerce stores to survive amidst the competition, they have to opt for personalization to retain their customers. User engagement plays a vital role for eCommerce business and personalization of products and services increases that to a significant level. When you are sending personalized emails and messages to your customers, each click leads them to the store and they spend some time scrolling through the products and that increases your chance of more sales. Similarly, while designing personalized products, your customers spend quite a bit of time on your store designing and ordering their products. User engagement though seems to be an optional aspect but in reality, does a lot to improve eCommerce sales. eCommerce businesses in future won’t be able to continue or succeed in the market without providing personalized services. Today, what seems to be an opportunity to differentiate yourself from the herd will be the norm in the future. Are you prepared for this change? Author Bio: Mr. Pratik Shah is the Creative Head of Brush Your Ideas, a Web-to-Print technology solution offering consisting of Magento product designer extension and readymade Web-to-Print Magento Store. He is a tech enthusiast and an avid blogger and writes about eCommerce and web-to-print industry.